Lady Cecil's Tiger Cliff thrust home late to claim a last-gasp victory in a thrilling Betfred Ebor at York. Following heavy rain overnight, Europe's richest handicap promised to be an attritional affair, run over the stamina-sapping distance of a mile and three-quarters, and there was drama as soon as the stalls opened as leading contender Opinion completely blew the start. Luckily for him he soon made up the ground due to the sedate early gallop. As the pace gradually increased the strong-travelling Genzy looked the likely winner halfway up the straight, but challengers from further back began to emerge and though he galloped on strongly in the final furlong, 5-1 shot Tiger Cliff fairly flew home in the hands of Tom Queally to get up by half a length. Number Theory was a length further back in third, with heavily supported favourite Ted Veale making late headway into fourth. 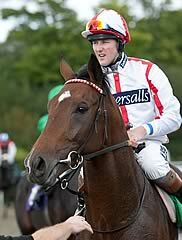 Queally said: "I wanted to angle to the stands side as much as I could because it's a bit quicker there. He travelled well and we were happy to see the rain as he has the attributes of a horse that handles cut in the ground. "He always finishes his races and he dug deep when it mattered. It's probably one of the hardest races of the year to win. It's good when a plan comes together. It's great for Henry Ponsonby (owner) and the team at home." Ponsonby added: "I'm very emotional, I know Sir Henry (Cecil) would have loved this. It's just wonderful. He's still a very untapped horse this. I must thank my owners, Michael Marshall and Lady Cecil, all at team Warren Place." Marshall was assistant to Cecil and has continued in the role since the licence was passed over. He added: "It's a team performance - a great job. On his homework we felt he had a great chance. We weren't sure on the ground but we took a chance." Genzy's trainer Ian Williams said: "You'd think he was the winner a furlong out. He's run a blinder and we're delighted with him. Probably his race last week (in the Geoffrey Freer at Newbury) left its mark a little bit, but we're very happy with him. He's run great. "He may go to France and run in the stayers' race on Arc day (Prix du Cadran). He qualifies for premiums over there."